Whether you are a professional sports team, an amateur group of keep-fit enthusiasts or you manage a sporting team or club, the Sport-Tek Ladies V-Neck PosiCharge Competitor Tee is a great choice. From the basketball court to the baseball diamond, and from the running track to the soccer field, this tee will give you the edge over your competition in both functionality and style. Let you and your team play to the best of your ability while looking your very best. We offer a wide variety of colors in this tee to ensure that your organizations color schemes can be matched. Using unique materials, a modern design and a fit tailored to the female form, you can be sure you will always look your best. While this Sport-Tek tee is ideal for teams of all kinds, it can also be worn casually for unbeatable day-to-day comfort, especially in warmer climates where cotton is not always the best option. 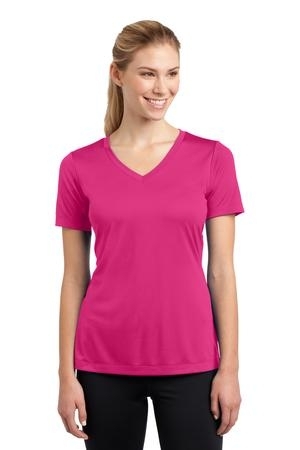 The Sport-Tek’s Ladies V-neck PosiCharge Competitor Tee stands out from the crowds in design, functionality and style. The v-neck offers a feature not often seen in this style of tee and will have other ladies teams envious of your cool team tees. No matter what the weather, this v-neck tee is a great choice for breathability, comfort and style. The Sport-Tek Ladies V-Neck PosiCharge Competitor Tee comes in a wide reange of colors to suit every preference and requirement. The colours avilable in theis fabulous tee are; Black, Cardinal, Carolina Blue, Deep Orange, Gold, Hot Coral, Iron Grey, Lime Shock, Pink Orchid, Pink Raspberry, Purple, Tropic Blue, True Navy, True Red, True Royal and White. With this wide range of coors to choose from, this tee is even more versatile and can be adapted to just about any color combination your team or organization might need. Using quick-wick technology, the Sport-Tek Ladies V-Neck PosiCharge Competitor Tee moves moisture away from the skin keeping you dry and warm. Lightweight and breathable, this versatile tee offers a comfortable wearing exeprience. Colors are kept locked in using PosiCharge technology, which also prevents logos from fading. At just 3.8ounces and constructed from 100% cationic polyester interlock, this tee is comfortable and durable. It also features a gently contoured silhouette with a removable tag for extra comfort and easy relabelling, making customization for brands and teams a piece of cake. The slight scoop neck and set-in sleeves gives comfort in any weather. Available ladies sizes are; XS, S, M, L, XL, 2XL, 3XL and 4XL. Tees in every size are constructed in the same way making sure the fit and feel is kept to the same high standards.